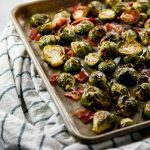 This recipe for Roasted Brussel Sprouts with bacon is easily the best by far. Quick and delicious, brussel sprouts will become your favorite vegetable! Trim outer leaves and halve brussel sprouts. Toss with olive oil and season with salt and pepper. Spread onto a nonstick baking sheet. Roast brussel sprouts for 20 minutes, turning halfway through. While brussel sprouts are roasting, cook bacon and chop into 1/2 inches pieces. Combine bacon and brussel sprouts, toss in maple syrup and serve. Enjoy!